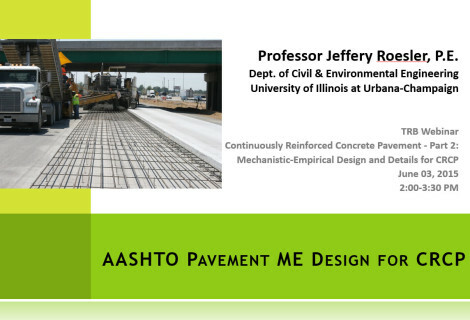 At the time the AASHO National Road Test was undertaken near Ottawa, Illinois, Continuously Reinforced Concrete Pavement (CRCP) had already been developed and was in service in several eastern, midwestern, southern, and western states. Although it was not included in the AASHO Road Test, it soon became a popular design, and within the past two decades, almost 14,000 equivalent two-lane miles of CRCP 24 feet wide have been constructed in the United States. Texas has constructed more than 3800 miles, Illinois 2700 miles, and Mississippi is the third leading user of CRCP with 1000 miles. 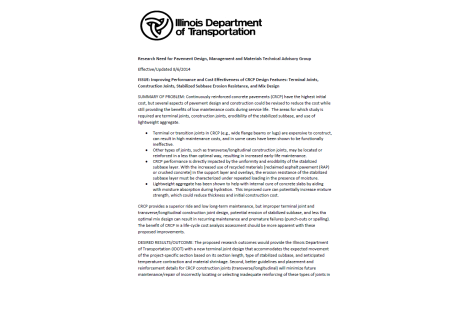 Twenty-eight states have standard design and construction specifications for CRCP as published in the Associated Reinforcing Bar Producers-CRSI “Summary of Design and Construction Practices of Various States.” In the past for highways, it has been customary to design concrete pavement based on stress of the maximum axle load, with a permissible reduction in thickness for CRCP of up to two inches. For airports, the thickness reduction has not been customarily used. 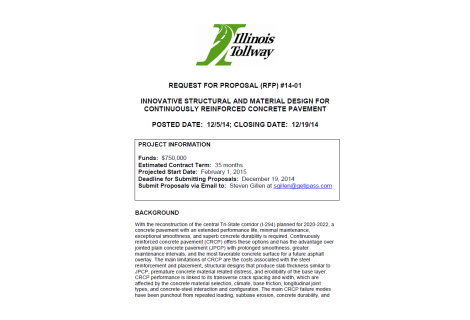 In recent years, various modified procedures have been developed and suggested for the design of CRCP for highways. These are the AASHO Interim Guide, ACI Design Procedure, Texas Design Procedure, and Illinois Design Procedure. 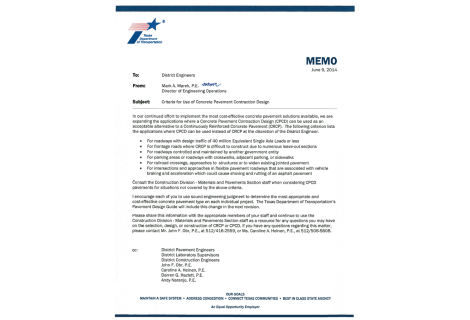 The Federal Highway Administration does not specify the method to be used; however, reviews for federal funding compare design proposals by states with the AASHO Interim Guide. 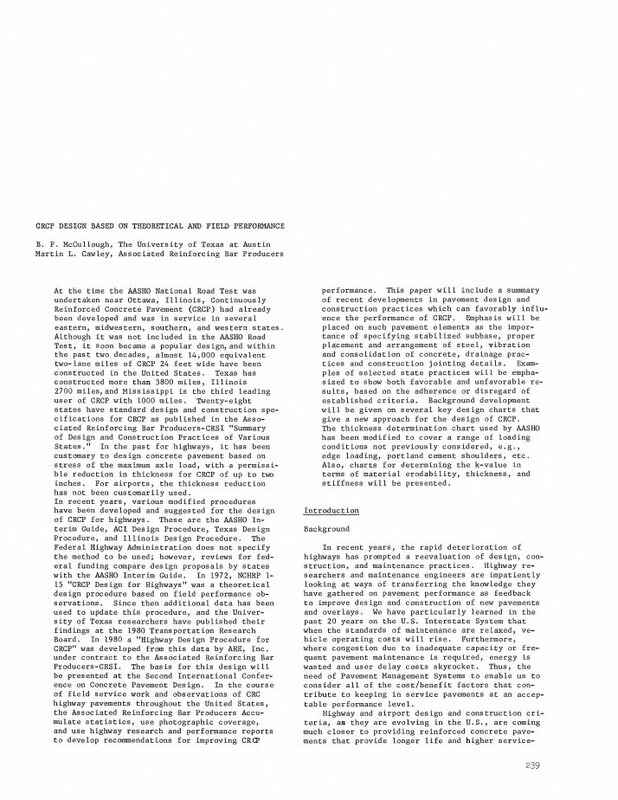 In 1972, NCHRP 1-15 “CRCP Design for Highways” was a theoretical design procedure based on field performance observations. 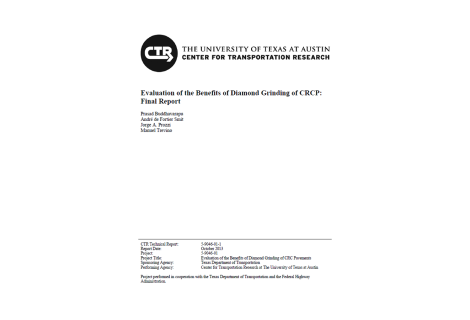 Since then additional data has been used to update this procedure, and the University of Texas researchers have published their findings at the 1980 Transportation Research Board. 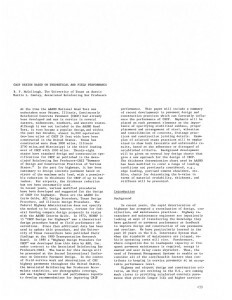 In 1980 a “Highway Design Procedure for CRCP” was developed from this data by ARE, Inc. under contract to the Associated Reinforcing Bar Producers-CRSI. 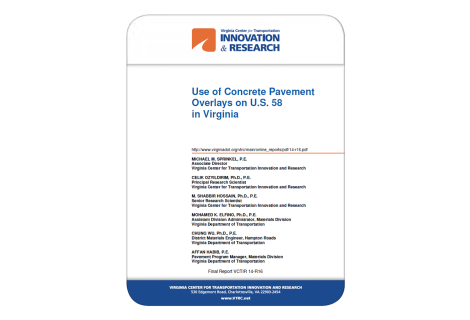 The basis for this design will be presented at the Second International Conference on Concrete Pavement Design. 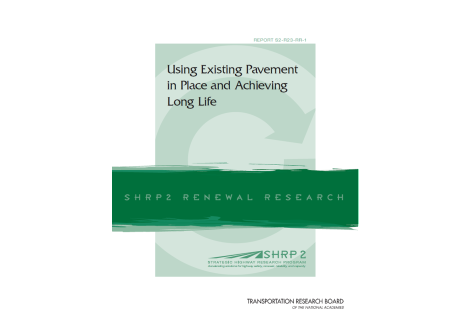 In the course of field service work and observations of CRC highway pavements throughout the United States, the Associated Reinforcing Bar Producers Accumulate statistics, use photographic coverage, and use highway research and performance reports to develop recommendations for improving CRCP performance. 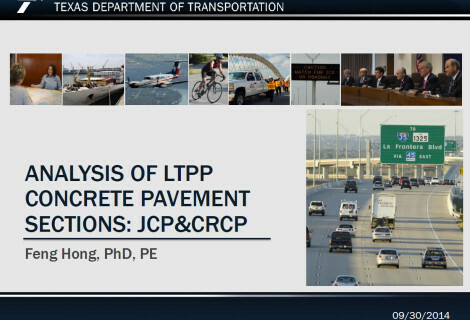 This paper will include a summary of recent developments in pavement design and construction practices which can favorably influence the performance of CRCP. Emphasis will be placed on such pavement elements as the importance of specifying stabilized subbase, proper placement and arrangement of steel, vibration and consolidation of concrete, drainage practices and construction jointing details. Examples of selected state practices will be emphasized to show both favorable and unfavorable results, based on the adherence or disregard of established criteria. 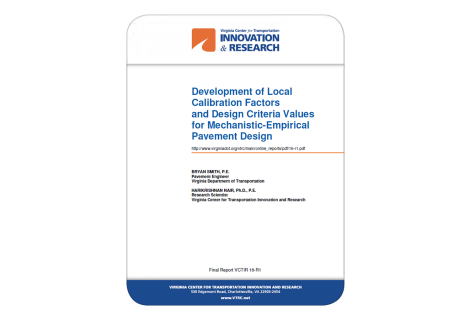 Background development will be given on several key design charts that give a new approach for the design of CRCP. The thickness determination chart used by AASHO has been modified to cover a range of loading conditions not previously considered, e.g., edge loading, portland cement shoulders, etc. 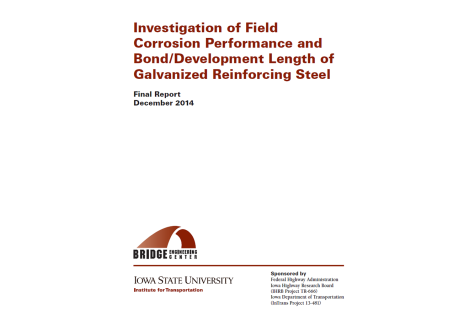 Also, charts for determining the k-value in terms of material erodability, thickness, and stiffness will be presented. Presented at the 2nd International Conference on Concrete Pavements in 1981.